A warm pan of this stuff– this olive oil-soaked bread– is dangerous. Craig Kominiak’s Focaccia is the type of thing I could polish off myself in one sitting. There was some talk about KitchenAid burnout from the full batch of dough, which made three breads. In the interests of both self-restraint and my red KA, I did just a third of it. No problems with the mixing, and only one pan of focaccia to tempt me. Don’t make this dough in the morning and expect to have focaccia by dinner. It needs a solid 24 hours to rest in the fridge (after two room temp rises) for flavor and air bubbles. I was daydreaming about that pizza from a couple of weeks ago, and in the course of that downtime made a pan of caramelized onions to top my bread. I think with focaccia, as with most things savory, the more olive oil the better. Rather than sprinkle my baking sheet with cornmeal, I lubed it up with extra oil before stretching the dough into it. Then I brushed garlic and thyme infused olive oil all over the top. At the half-way point in baking, I scattered on my caramelized onions (so they wouldn’t burn), popped the focaccia out of the pan and slipped it directly onto my pizza stone to finish baking. I had delicious oily, salty bread with an almost fried bottom crust. If I had a criticism, it would be that slashing the dough, as the recipe calls, just before baking seemed to really deflate the air bubbles and inhibit its rise. Next time, I’ll dimple the dough with my fingers instead and hopefully it will be puffy and tall. For the recipe, see Baking with Julia by Dorie Greenspan or read Sharmini’s blog Wandering Through (a modified version is also here and there’s a video here). Don’t forget to check out the rest of the TWD Blogroll! Those carmelized onions look heavenly. I adore focaccia bread and totally agree – the more olive oil the better. Yours looks delicious with the caramelized onion topping. love love love caramelised onions! your focaccia looks delish! thanks for baking along this week. Your focaccia looks great with the onions. I agree about the slashing. I will dimple next time. I’ve actually never seen focaccia slashed, only dimpled. I agree…your caramelized onions look so good and are a great addition to your photo. We had so much fun with the focaccia…toppings and sandwiches, and…. Such a good recipe to use. I think I’ll leave off the cornmeal next time…it is good and does it’s job, however….well, it creates extra mess…seems to get everywhere. Maybe its just because we were carrying this bread around as part of our Superbowl food. Anyway, you have great ideas. Yum – your bread looks delicious! I wish I would have dimpled instead of slashed. Mine was way too flat. What a delicious photo! Love the caramelized onions! 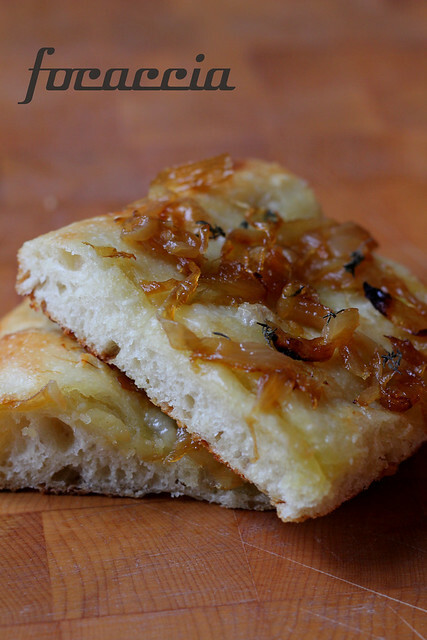 This focaccia definitely has the tendency to become addictive, even more so with caramelized onions as a topping.